Posh have been less effective since Callum Elder picked up an injury. Photo: Joe Dent/theposh.com. Peterborough United manager Graham Westley will put his coaching reputation on the line as he tries to strike the right balance between attack and defence in time for a League One promotion push next season. Westley was pleased to see his side become top scorers in the division again following their 3-1 Good Friday win over Coventry. Jack Baldwin has made just 15 appearances for Posh this season because of injury and suspension. Photo: Joe Dent/theposh.com. 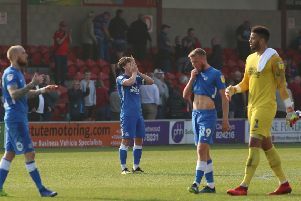 But he was concerned at how poorly his side defended in the opening half against the Sky Blues when goalkeeper Ben Alnwick saved Posh from a possible drubbing. Posh have now scored 65 goals in 38 League One matches which is the same as second-placed Wigan and fourth-placed Gillingham, but they have conceded 61, and only four teams (Swindon, Bury, Colchester and Crewe) have let in more. Posh went past the traditional League One safety mark of 50 points for the season with the win over Coventry leaving Westley to experiment if he so desires. “If I can’t solve the club’s defensive issues then I am not the coach I think I am.” Westley stated. “The concerns we have are very easy to cure as long as everyone takes the instructions and advice on board. “It’s obvious from looking at our goals for and against records where our problems lie and where we need to improve. “The defensive organisation needs to be better and it will be. “Watching the Coventry game back on television, one of the commentators said that I had made changes to my defence in 20 different games and he’s probably right. “I’ve had Michal Bostwick out, I lost Callum Elder, while Jack Baldwin and Gaby Zakuani were injured, and I’ve had suspensions. So many forced changes never helps, but it’s a team effort offensively and defensively. We’re all in it together and I need everyone to show the same level of application as Aaron Williams does. “Aaron, like Conor Washington before him, is a fine striker, but he is also a very effective first line of defence.